Storms are usually named in alphabetical order from the area where they begin. St. Jude was named in England but was re-named by SMHI (Swedish Meteorological and Hydrological Institute) to Simone after the name of the day in the calendar (in Sweden, each day of the year has one or two names) that the storm reached the Swedish west coast. The weather was less severe than expected at Tjärnö, but still quite strong winds and high water levels. I could still see the traces of this a month later, as we took a walk around Saltö. The clear evidence of how high the water has reached during the last storm can be detected by looking at the size of the beach cast wrack border, and how far up on the beach it is. This picture shows three clear rows of wrack borders where algae and eelgrass has been gathered by water movements. During the storm Simone, a lot of algae was washed high up on shore. The material in the wrack border tells us that the entangled algae and some mussel shells were torn away from quite deep locations. Among the species of mussels that I found in the wrack border was the horse mussel (Modiolus moduolus) which looks a bit like the common blue mussel (Mytilus edulis) but is larger and lives at greater depth. So, how do I tell a Modiolus moduolus from a Mytilus edulis? If you look closely at the picture, you’ll see that the pointy part (the umbo) is not at the tip of the shell as it is on the Mytilus edulis?, but slightly higher up on the shell. The shell of the Modiolus moduolus is also slightly browner than that of the Mytilus edulis, which is typically blue, as the common name denotes. 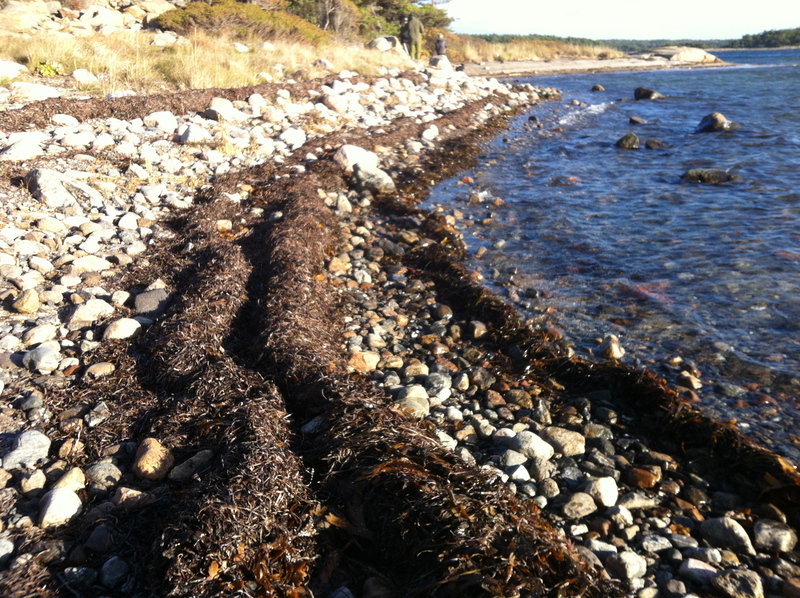 Other traces on the beach shows that part of the beach cast comes from Norway or even as faraway as from the British Isles, and has been transported all this way before ending up in this tangle of seaweed on Saltö. 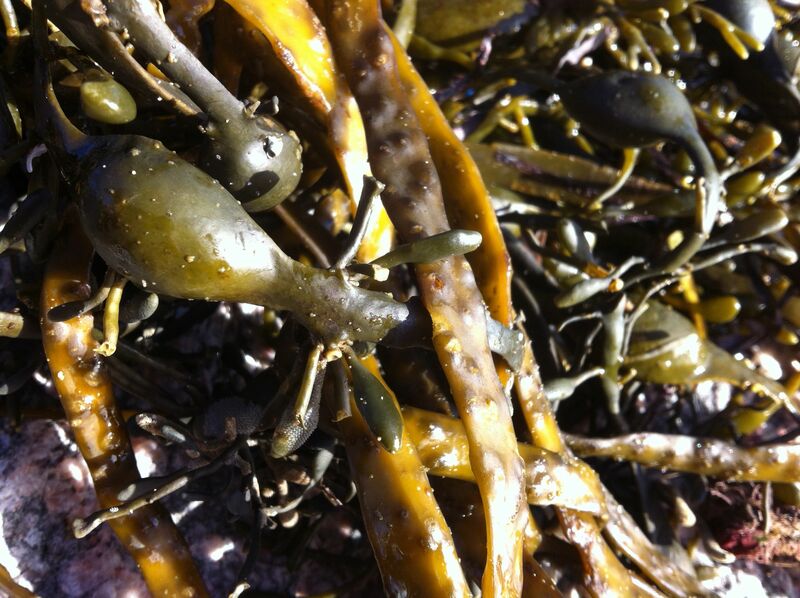 I found Ascophyllum nodosum, which also grows on the rocky shores around Saltö, but these specimens had much larger vesicles (floating bladders)than the ones at Saltö and were entangled together with reproductive parts of Himenthalia elongata, an algae species that is sometimes referred to as “sea spaghetti”. Amongst our other exciting finds were several unusually large cuttlefish skeletons. 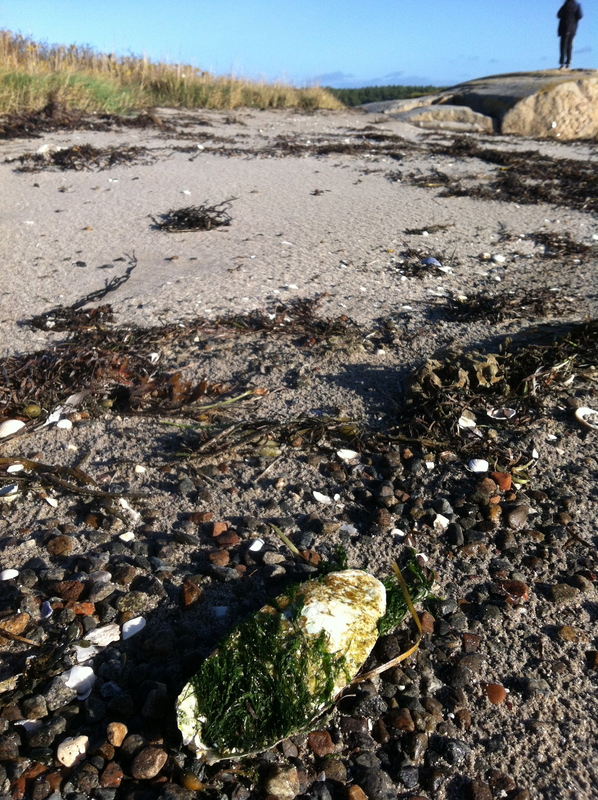 It looked like they had been floating for quite some time in the sea, as they had a lot of green algae growing on them. They are often used as a source of calcium for caged birds. In days of old they were called “whale fish scales”, which is a double fault since the whale is not a fish and hence does not have scales. There were also remnants of the summer’s fun and games. 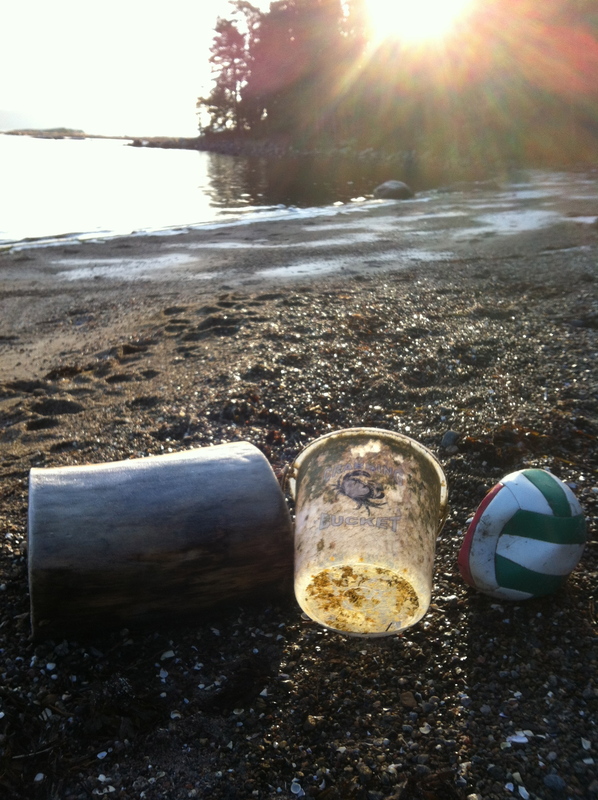 The lost bucket for catching crabs and a deflated ball. 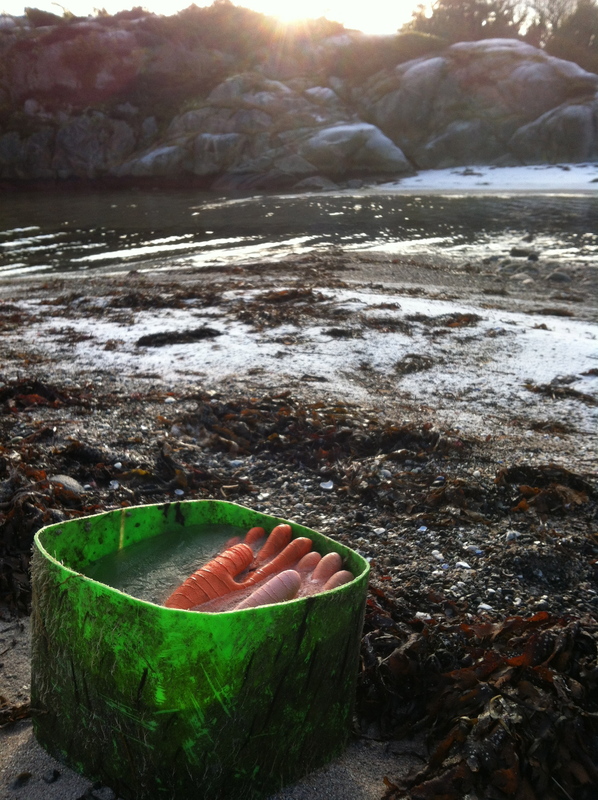 Or the almost ghostly rubber gloves in a bucket of frozen water, which looked like an art installation. 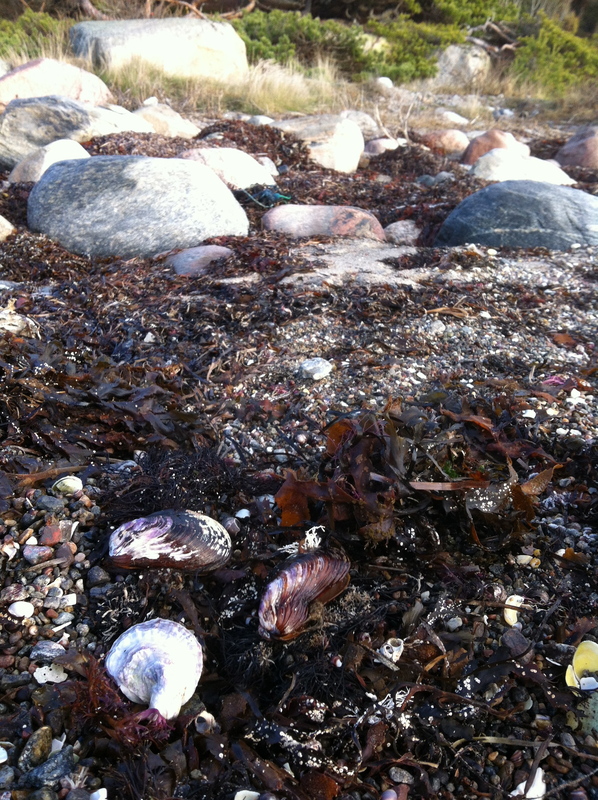 It was a cold but sunny day in November that we made all these discoveries at Saltö, which is part of the Kosterhavet marine national park near the Tjärnö Marine Laboratory. It will be exciting to come back around the New Year and see what coming storms have brought us, and if the bucket with gloves or the ball are still there. Maybe there will be some new species of seaweed from a faraway place, brought here attached to a floating shoe, a log or some other flotsam.